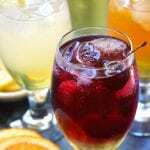 A light, refreshing and antioxidant filled adult beverage. In an approximately 16 oz glass add ice and limoncello. Slowly pour in Bai Bubbles and garnish with your favorite fruit. Enjoy! !